The Rockefeller Foundation published a report in 2008 declaring the twenty-first century to be the century of the city. For the first time in world history, a majority of the earth’s population resides in cities. Foreign Policy magazine devoted an extensive series to cities in late 2010, noting that: “The 21st century will not be dominated by America or China, Brazil or India, but by the city. In an age that appears increasingly unmanageable, cities rather than states are becoming the islands of governance on which the future world order will be built.” 84 percent of Americans live in metropolitan areas, and it is within these diverse and dynamic regions that policies to nurture successful economies must be formed. Our economic competitors are now scattered around the globe; even being the best in the U.S. is no longer good enough. Dynamic metropolitan areas, now more than ever, depend on transit systems. Urban areas concentrate jobs, culture and entertainment in ways that cause cross-pollination and innovation to flourish. Public transit systems are the arteries that allow these regions to circulate, to acculturate newcomers and immigrants, and to provide opportunity and access to all regional residents, at a scale in which automobiles are not suited. International quality of life surveys, such as those by Mercer, the Economist Intelligence Unit, and Monocle, assume that a comprehensive and convenient transit system is a part of the package for a high quality city. Needless to say, American cities do not rank high. Several American metropolitan areas, however, such as Salt Lake City, Dallas and Denver, have made bipartisan commitments to strengthening their transit system, including significant investments in new rail transit. These metro areas realize that in the 21st century, transit investment is not a luxury, not a sidelight, not a divisive partisan issue, but a core component of metropolitan success and a measure of competent governance. Transit also responds to two emerging demographic factors: the rapidly growing elderly population, who may not be able to continue driving, and the effect of the millennial generation, which is less likely than their parents’ generation to have a driver’s license or to own a car. The Seattle metropolitan area has led the way in transit commuting in the U.S. A Brookings Institute report noted that only four cities have lower rates of solo automobile commutes than Seattle, and transit usage increased remarkably during the 2000’s. 30 percent of commuters throughout the region chose other modes, and among workers in downtown Seattle, a recent survey showed that only 35 percent drove alone. 40 percent used public transit. The public transit that the King County Council currently has the power to protect, or atrophy and neglect. Ridership records show that over the past 15 years, public transit has transitioned from predominately trips between Seattle’s neighborhoods, to an essential component of regional transportation. Since beginning in 1999, Sound Transit has expanded to provide 70,000 customers daily with regional transit offerings. Meanwhile, ridership on Metro transit non-Seattle routes has soared, demonstrating increasing demand for regional transit service. As our freeway system has reached capacity a growing number of commuters have responded by switching to regional transit. A robust public transit system is no longer an optional item for King County, expendable in lean fiscal times. 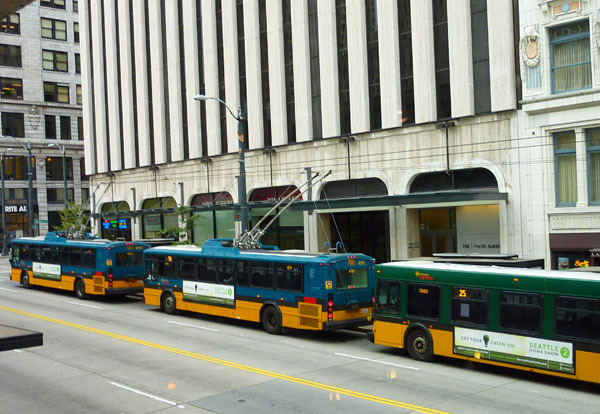 Public transit has become an integral component of our regional economy, and increasingly a driver and enabler of further economic growth in the job centers of King County. All the discernible trends show that the importance of transit in metropolitan areas is increasing. If you support further economic development in King County, if you support integration of immigrants and low-income persons into our society, if you support retaining and strengthening our region’s competitive edge in an increasingly global marketplace, then support using the authority granted by the State to maintain funding for King County Metro transit. Support the $20 per year cab tab fee known as the Congestion Reduction Charge. Chad Newton is an Environmental Engineer and Seattle resident. Ill vote for it if it comes to a public vote, if and only if they reopen the ride free area contracts and raise user fares.